Reaching what Peter David calls "a crisis point in his life" in the introduction to Aquaman: Time and Tide, Aquaman settles in a cave at the bottom of the ocean, surrounded by various memorabilia from past exploits and reflecting on his past. 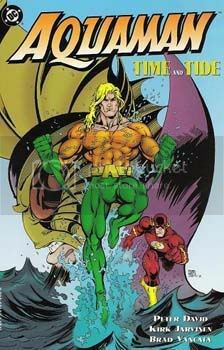 We see the hero’s first struggles with his warring aquatic and human origins, his first love affair and the disastrous results, his introduction to Barry Allen and the idea of being a superhero, and finally his first meeting with the villain Ocean Master (though not necessarily in that order). Along the way, Arthur stumbles over a few disturbing revelations that may or may not spell doom for his future. Aquaman is a character that’s always struggled to be taken seriously, and as such Peter David challenges his readers to look at him in a different a way. The Aquaman of David’s story is a tragic hero wedged between the surface world and that of the sea. Slowly but surely he comes to feel that his heritage has already laid out his path before him and that the path in question may be one too dark for his sanity to withstand. The introduction of the first chapter achieves this well, starting off with the familiar, funny, and touching scene of a girl and her mother flushing a goldfish down the toilet. We follow the goldfish through the sewers, into the sea, and right to Aquaman’s doorstep where it’s promptly devoured by a bigger fish. The reader is forced to stop looking at Aquaman as he might look at other superheroes. This is a man who lives in a world sharply contrasted to our own, and we have to realize that before we can ever hope to understand him. Perhaps David’s most successful device in evoking Aquaman’’s warring sides is the contrast between the introductions to the second and third chapters of the tale. The second chapter opens with Aquaman battling Asian sailors to save the life of a pair of dolphins, while the beginning of the third chapter features the same hero fighting off a polar bear to save a girl who was trying to kill it. Unfortunately, there are David often seems to be trying too hard to impress us with Aquaman’s individualism. At the end of the first chapter, Aquaman recalls--among other things--an attack by a supervillain. He reacts in a particularly un-superhero manner, and his actions, along with those of the villain, seem terribly forced. It’s scenes like this where David seems to be telling a lot more than showing. When Aquaman turns on the crowd witnessing the battle and explains precisely why he did what he did, you feel like you’re being spoonfed, and the whole thing seems disingenuous. Jarvinen’s renderings of the hero also hurt the idea that this guy is much more than your garden variety do-gooder. Jarvinen’s style is too cartoony for the story, and it’s difficult to see past Aquaman’s cheesier aspects when he’s drawn in such an iconic staring-into-the-camera-with-a-gleam-in-his-eye way. David’s own writing betrays the idea sometimes, having Aquman and Aqualad engaging in witty, Silver Age-esque banter while storming Ocean Master’s submarine in the last chapter of the trade. The second chapter, "Fish Tales," stands alone in the collection as a touching, heart-wrenching story about Aquaman’s first days. Raised by a school of dolphins, and even believing he’s a dolphin himself, Aquaman’s early years are written in a very Tarzan kind of way, and David even admits this in the intro to the trade, saying he often calls it the "Jungle Tales of Aquaman." Aquaman’s final revelation at the end of trade is a surprise, but unfortunately not in a good way. It falls flat because David really hasn’’t convinced us it could possibly be true. David has a history of looking at darker sides of heroes, of taking them to the breaking point and seeing how they fare, such as his work on The Incredible Hulk and Captain Marvel, but this time it seems like he’s trying too hard. Perhaps in the context of the rest of Aquaman's history, Aquaman: Time and Tide might work. But to a reader relatively new to the character, it doesn’t, which is sad since it seems that’s precisely who David was trying to reach. I should also mention that if you do decide to pick up the trade, it may be a good idea to skip David’s introduction until after you’ve read the stories. In explaining the stories, he reveals quite a few "surprises," which may not have helped my enjoyment of the story. While overall I didn’’t enjoy this collection, I should say that David has succeeded in one aspect. Though most of the story doesn’t work, if you, like me, never really gave Aquaman a second thought, the aforementioned second chapter may, all on its own, make you care about this character just a little bit more.